Courtney Lee was diagnosed with multiple sclerosis when she was 20, when she was working toward her degree in criminology. 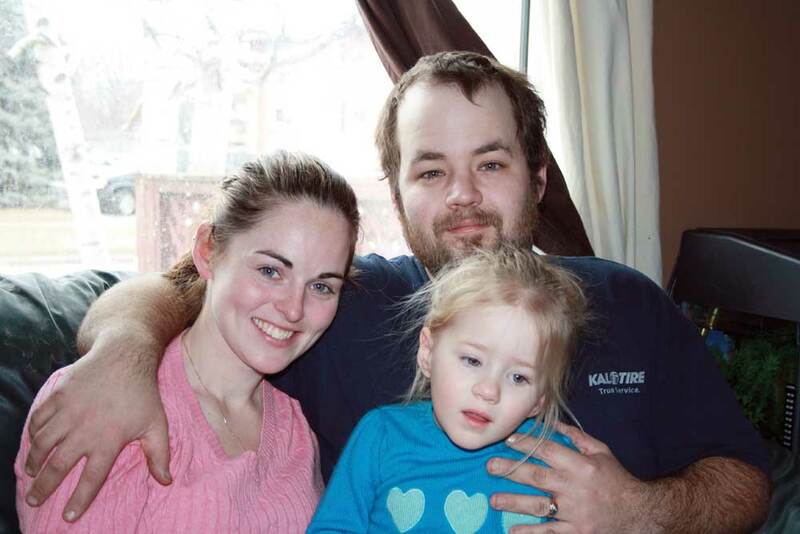 With her symptoms subsided, thanks to a new treatment, she is spending as much time as she can with partner Joe and daughters Paytin, 2, seen here, and Marion, 5. Courtney Lee wanted to be a police officer. It was something she had always wanted to do, and it was something that she was going to school for, working toward her degree in criminology. However, after having some pain in her left eye, Lee decided to visit a local clinic to see what was going on. It was then that Lee decided that she needed to get a third opinion. After having an MRI and having blood work done, Lee was sent to see a neurologist. That was when she received the news that would shape her future. To make matters worse, Lee found out that her lifelong goal of becoming a cop was now out of the equation. To help make ends meet, and with her MS manageable, Lee went to work, taking on a job working midnight shifts at the Sobey’s warehouse in Whitby. However, after having Paytin, her second daughter, Lee knew she couldn’t do that anymore. “After I had her, about 10 months after, I knew I couldn’t go back to midnights. Not with two kids. There’s no way I’ll ever get sleep,” she says of what led to her decision to go back to school, choosing to attend Trillium College in Oshawa to become a community service worker. Another road bump came in Lee’s life during this time: her MS had returned. Lee has relapsing-remitting multiple sclerosis. This means that her symptom’s are not constant. Instead, they come and go. Lee, who loves to play soccer during the summer months, was beginning to lose something that was very important to her: mobility. Thankfully, Lee had her family and friends by her side to help her out. However, even with the assistance, Lee decided she needed to do something about her symptoms and to take her life back. That was when her neurologist recommended a new type of treatment. It was so new, in fact, that Lee would become the first person in Canada to take it outside of clinical trials. Alemtuzumab – more commonly known under its trade name, Lemtrada – is a therapy regimen that was originally designed in the 1980s to treat chronic lymphocytic leukemia, cutaneous T-cell lymphoma and T-cell lymphoma. Derived from a cultivated rat antibody, the treatment was found in the last decade to be an effective treatment for relapsing-remitting multiple sclerosis – what Lee has. The treatment is delivered via an intravenous infusion for five consecutive days, and then through another three-day treatment one year later. Lee says the treatment – for which she was the first to receive outside of clinical trials in Canada – has made a world of difference. Lee’s next round of treatment – the three-day session – is currently set for the beginning of May. In the meantime, Lee has to do regular bloodwork to ensure that any potential side effects – which include side effects common to infusion treatments such as rash, headache and nausea, and other effects such as back pain, infections and bruising – don’t pop up. One thing that is evident with Lee’s progress is the house that she and her partner, Joe, have bought for them and their two girls. While Lee’s MS symptoms remain in remission, she is making the most of life by doing as much as she can with her family. Lee, who now works as a community support worker in Oshawa, says that looking back, there weren’t as many services for those newly diagnosed with MS and would like to see more. After being diagnosed with the disease at 20, Lee says more young people should get themselves checked if they think something might be wrong, adding that having services available for younger people with the ailment would have made things easier. However, since the Lemtrada treatment, Lee says that her life is on track and that it has made herself who she is once again.